Click on each animal's photo to see their individual art creations for sale! Payments are available by PayPal, or contact Stefani Skrovan sskrovan@mlml.calstate.edu for more information. Animal artwork has grown in popularity among art enthusiasts and collectors in recent years. 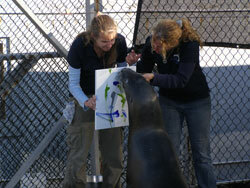 It showcases the animals' creativity, as well as the collaboration between animals and their trainers. ATR has begun offering our sea lion artwork for sale as a unique item for friends of ATR and animal enthusiasts alike, as part of our fundraising efforts. These provide a one-of-a-kind sea lion collectible, and all of the proceeds from the animal artwork go directly back to the sea lions and their medical costs. 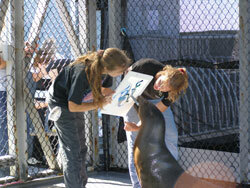 In 2008 and 2009, all of our six California sea lions were afflicted by a series of mysterious illnesses. The medical treatments have cost thousands of dollars per week in some cases. Therefore, you can take comfort in knowing that when you purchase one of our sea lion paintings, not only are you receiving a unique gift, you are also helping to support the health of our animals. We offer sea lion paintings in everyone's price range, from $25 to over $1,000 (plus S&H), most costing significantly less than you would find at zoos and aquariums! Check back frequently, as new paintings will be coming all the time!